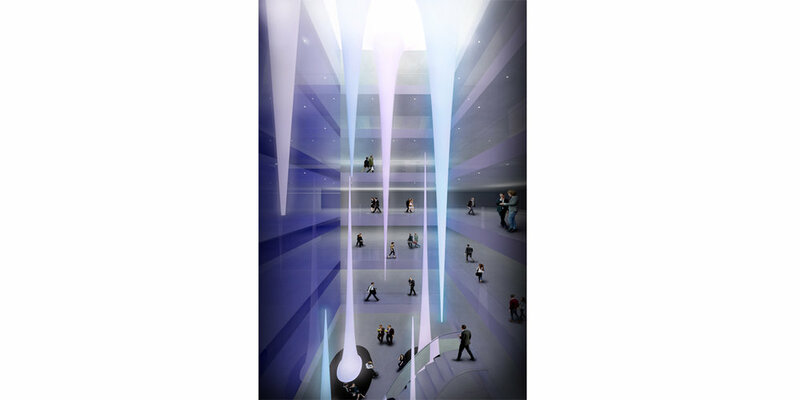 Luminous towers is a system of lightweight funnels bringing light into the main atrium at ARUP’s No8. The design blends architecture and engineering, through the intelligent use of the material properties in combination with light. The concept, deals with a system in tension, which adapts and re-distributes through time. The idea of building the light is achieved through the use of two main materials: Tensile fabric and Light. The outcome system, adds value to the atrium space while creating an impressive installation which can be flexible and adapt to the building moods. The design aims to create a maximum effect through the intelligent use of one material, while it adds to the current office illumination, leading to a more productive office environment. 3. Raise awareness about circular economy though reusability, ease of transportation and assembly of the structure. It consists of an assembly of elements made of white tensile fabric, creating a unique designed ecosystem to experience. It is a designed and engineered artificial landscape of stalagmites and stalactites, a population of pure geometries in tension with a single pulling point for each tower. Simultaneously, these pure white drops and peaks are illuminated creating unique atmospheres while they can move subtly, upwards and downwards like a breathing organism. The scale and the verticality of the design, creates dramatic views from every floor, where a different moment of the installation is captured. Simultaneously the bases of the towers consist seating area at the basement level, which can be used for informal meetings or events. Due to its inherent reusability, the design is reconfigurable and flexible to travel around the world or can be used for various events, promoting architecture and engineering at its best.